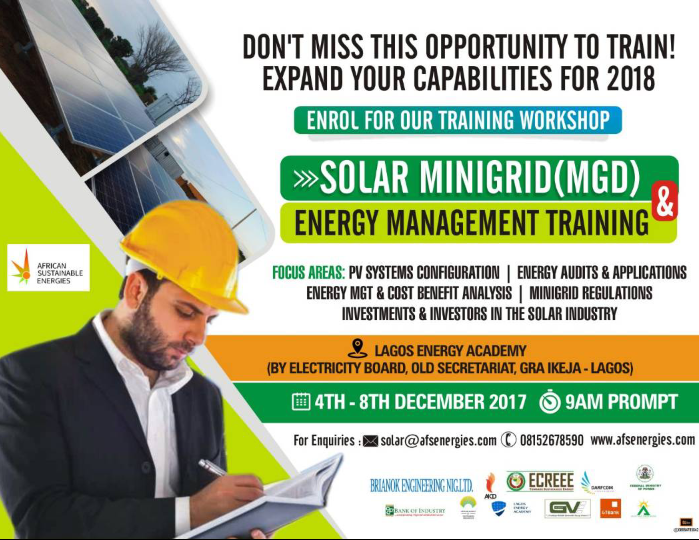 African Sustainable Energies in partnership with Brianok Engineering, Lagos Energy Academy and Federal Ministry of Power will be organizing a 5 day power-packed training on Solar MiniGrid (MGD) design and Energy Management from 4th to 8th December, 2017. This workshop is scheduled to take place at the Lagos Energy Academy, GRA Ikeja, Lagos. The Solar Minigrid Design and Energy Management workshop will encompass 80% practicals, 20% theory, and Professional certification for successful participants. After the course, participation opportunities in various solar projects would be available for those interested.